Today I was wondering when was the last time I put together a proper wishlist and I figured out it was back in July?! How crazy is that? I've been proper skint lately what with coming back from an amazing holiday and transferring jobs so not getting paid for like, 6 weeks! 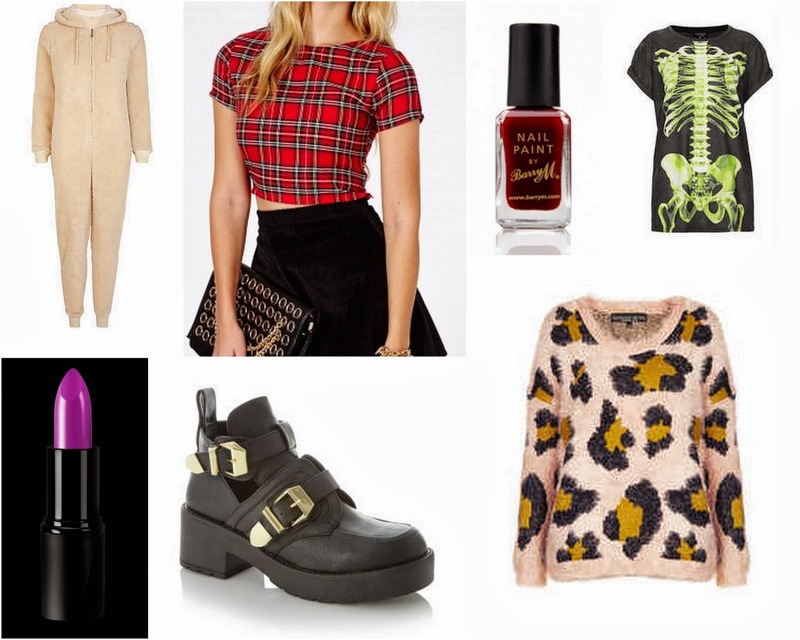 However, I have been lusting after quite a few items so I've put together a little wishlist as I thought it was about time (obviously)!! I don't know what it is about onesie's (I currently have 5...) but I just cant get enough; they're so comfy and you can get some really cool printed ones. I currently don't have anything tartan but I love the print & always have done. I really want a tartan scarf but have failed to find one as of yet so I guess a crop top will have to do, its OK because I love crop tops just as much as I love onesies! This Barry M nail paint colour is 'Red Wine' and its just so perfect for autumn, I've gone through a bit of a stage of not wearing anything too bright on my nails but I'm hoping this changes soon as I love this colour; its just a perfect plum red. I love a statement t-shirt like this and obviously its Halloween soon so I couldn't resist?! Ive said it before but I LOVE leopard print and this jumper from Topshop looks so fluffy and cosy... I need it! I've seen these cut out buckled ankle boots from New Look before on another blog and they were actually being compared to the Jeffrey Campbells (I think...) and they're literally identical?! There is no difference whatsoever and I have been dreaming about them ever since. One beauty product I have seen pop up a couple of times over the last week is the Sleek true colour lipsticks. This shade is in 'Exxxagerate' and I was just attracted to the bright purple shade. I generally suit darker shades, I guess because I'm so pale and I think the swatch of this may actually be slightly darker than in the bullet and for a fiver you can't complain! The September & October Round-up!